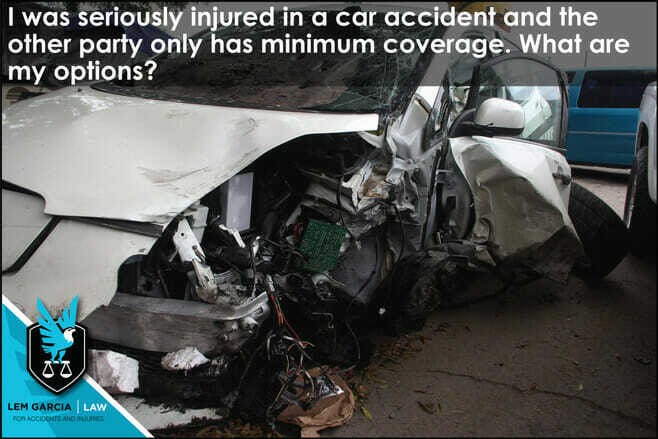 In California, the minimum coverage for bodily injury liability is $15,000 per person and $30,000 per accident. This means that the insurance company for the person that hit you, the at-fault carrier, will only pay one person up to $15,000 for their bodily injury claim. If multiple people were injured in the crash, they will only pay up to $30,000 for the entire claim and the most they will pay any one person is $15,000.00. If you were seriously injured in a car accident, this could pose a very serious limitation on how much money you can recover to compensate you for your bodily injury claim. Your bodily injury claim includes payment for past and future medical bills, past and future pain and suffering, and lost wages. Medical bills in serious injury cases can easily surpass $15,000.00, which means that the other party’s insurance coverage is not even enough to cover you for your medical bills, let alone anything for your pain and suffering and lost wages. This is why it is important to carry uninsured/underinsured motorist coverage through your own insurance policy. When you have uninsured/underinsured motorist coverage, you can recover money from your own insurance carrier in the event that the other party’s insurance policy is exhausted. For example, if you were seriously injured in a crash and have $25,000 in medical bills and the other party only has the minimum coverage of $15,000, you will not be able to recover all of your damages from the other party’s insurance company. They will only pay you up to their insured’s policy limits. In this situation, you will get paid $15,000 and you will still have to pay for your own medical bills and you will recover nothing for your pain and suffering. If you are fortunate enough to have underinsured motorist coverage, you can then turn to your own insurance carrier for compensation. If you have coverage of $100,000 per person, then you own insurance carrier can provide additional payment for you to recover up to $100,000, including what you have already been paid by the other party. If you do not have uninsured motorist coverage, then you will have to get compensated by the other party personally to recovery fully. Recovering money from an individual can be time-consuming and costly. It is important that you discuss this option with an attorney to determine whether it is worth the time and effort. West Covina car accident attorney, Lem Garcia, helps make sure that people who have been injured in car accidents get compensated as much as possible, whether through the other party’s insurance coverage and/or your own insurance coverage. Call to schedule your appointment today. Case consultations are always free.